For a mechanic, their dream is to have a combination of tools to meet all their needs at a go. This creates a need for a complete set that will ensure they can get any tool they want whenever they want to. If you’re looking for one too that can ease your work, you probably should look for the best craftsman tool set. A craftsman tool set is designed to fit all the tools a mechanic or home repair enthusiast needs to take care of a problem without rushing to their workshop. This makes them more efficient and improves their reliability. Since more options exist for such a tool set, getting the right one is paramount. This review sought to list among them the top options you can go for. Expect to learn more about our editor’s choice, budget, as well as best value options. 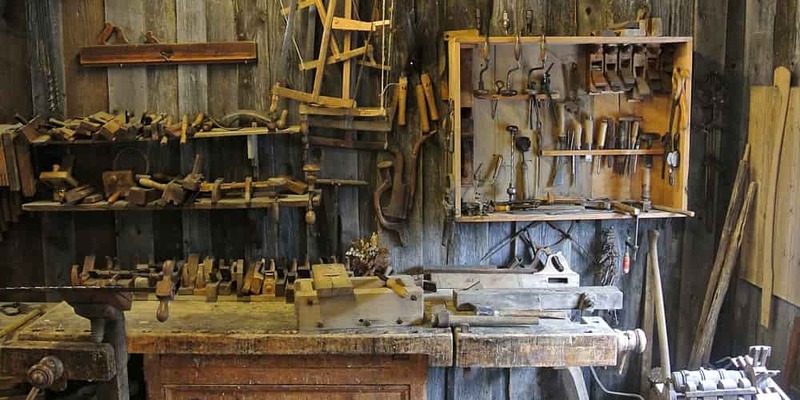 What is a craftsman professional tool set? The editor’s choice for the best craftsman tool set is the Craftsman 230-Piece.... The set is made up of a total of 230 tools, all meant to make everything seamless for the mechanic. The tools are also made of durable alloy steel and have silver finishing. These features ensure they can serve the user for longer and offer them the ease of finishing their work within time. 116 sockets set (1/4, 3/8 + 1/2-Inch Drive). Two extension bars (1/4 + 3/8” drive). Six combination wrenches (inch and metric). Three quick-release ratchets (1/4, 3/8, and ½ inch drive). Universal screwdriver with 40-piece set. 40 hex keys (inch and metric). The Craftsman’s mechanics tool set has tools made of alloy steel construction which ensures they are durable and can give the user prolonged lifespan. The tools are also designed with silver finishing which ensures they are corrosion free. The set, in addition, is versatile and has a total of 230 different pieces. This means it can be brought to any workstation and get everything done at once. Also, the tool set features three quick-release ratchets. The ratchets ensure it offers more convenience to the user. Massive 230-piecer which means a variety of tools for a variety of jobs. Includes universal joints and extension bars. Features sturdy and long-lasting tools. Some essential socket sizes missing. Some tools are loosely held by the casing. 66 socket sets (Eleven 1/4" drive inch sockets, eleven 1/4" drive metric sockets, six 1/4" drive deep inch sockets, six 1/4" drive deep metric sockets, ten 3/8" drive standard inch sockets, ten 3/8" drive metric sockets, six 3/8" drive deep inch sockets, and six 3/8" drive deep metric sockets). Six-point socket wrenches (inch and metric). 35 quarter inch drive tools. 14 hex keys (inch and metric). The overall build of the tools is sturdy which makes them more durable. The Craftsman case is designed with enough space for every tool. This makes portability easier if you’re constantly moving from one workstation to the other or meeting your clients anywhere you agree on. The kit also offers a total of 39 specialty tools. This means you can take care of most household repair jobs and even attend to some other professional-grade problems at a go. In addition, the tool set features additional specs like quick release tools which makes it easier to use and fastens the process. The tools kit might be a good deal for anyone looking for versatility. This is because it comes with a total of 108 different tools and for different needs. As such, you can have the set in your home for domestic repairs, while traveling, or in the garage for regular automotive repairs. Sturdy carry case for enhanced usability. Enhance versatility and ease of use thanks to the quick release ratchets. Multiple tools for a variety of applications. Some of the tools are not ideal for heavy tasks. The plastic parts are relatively weak and unreliable. 191 sockets (6-point, 8-point, and 12-point, in both inch and metric sizes). 6 extension bars for extending the reach. 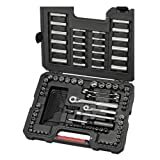 The Craftsman 450-piece mechanic’s tool set is designed with an array of 16 combination wrenches. These wrenches allow the user to slip in and work where the ratchets can’t reach. The set also features a magnetic handle for easy bit and nut installation. The tool set has a total of 450 pieces which gives the user the freedom to work on any repair job and from the same place. The kit also has 6 extension bars for extending the reach. Comprehensive set with 450 pieces. Huge variety of drill bits and socket heads. Handy storage case with compartments/drawers. Plastic casing does not guarantee long life span. Tool organizer a bit loose and some tools keep popping out. The Craftsman tool set features 6-point extension bars which allow for increased torque with fastener. The tools in the set are corrosion resistance. This is thanks to the chrome finishing. The tool case is also designed with large markings which makes it easy for socket identification. Some pieces do not lock firmly in the case. 23 combination wrenches (inch and metric). Chrome vanadium steel housing and finishing. 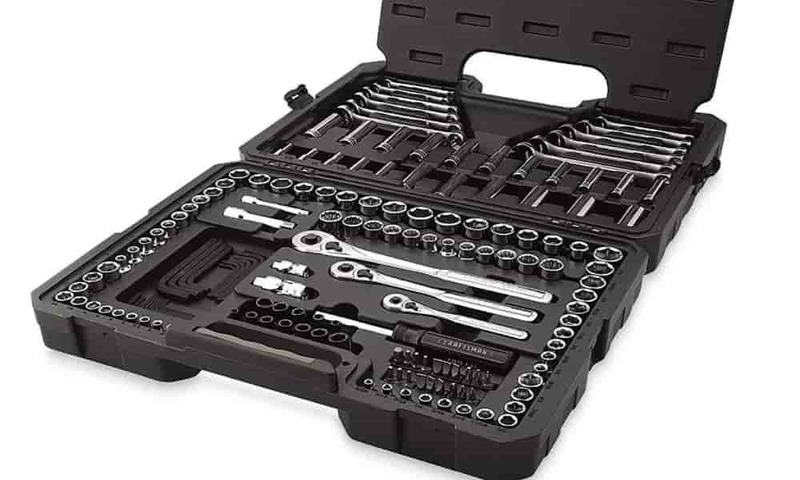 The Craftsman 165-piece mechanic tool set is designed to offer versatility to the user. This is because it has a variety of tools to use anywhere and for any need, be it for home repairs or automotive repairs and maintenance. With the variety of tools, the set also qualifies as the perfect asset for pros, amateurs, and DIYers. The tools in the set feature chrome finishing which ensures they are chrome resistant. The tool case is designed with the ease of mobility and storage. It is also durable which makes it a perfect long-time companion. The tool set also houses properly labeled pieces (with laser engraving) which makes it easy for one to locate the exact piece they want from the pool and also ensures the markings won’t fade. Durable carrying case for easer of mobility and storage. Some of the older cases have a problem keeping the tools in place. The wrenches are a little bit short. A mechanic’s tool set is a kit that contains almost everything that a user may need and for multiple operations. It could be for home repairs, garage use, or automotive maintenance while taking a road trip upcountry. 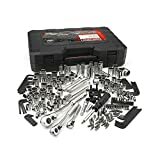 With the tools contained in a complete kit, there wouldn’t be a need for scavenging over mechanics’ shops looking for a certain wrench while you have a variety of the same. 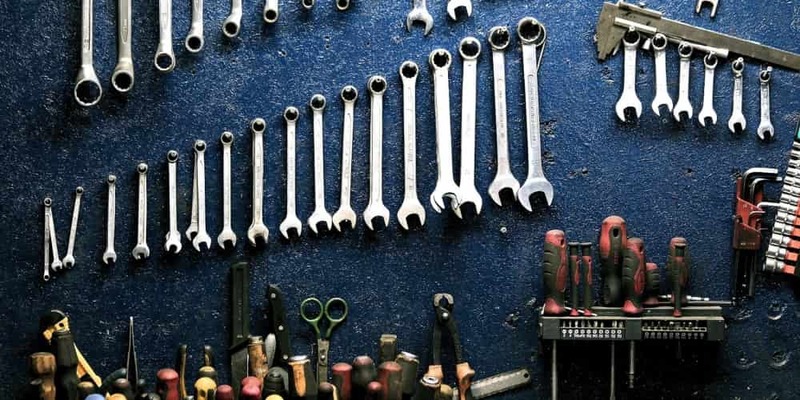 If you’re an individual who usually has scattered needs for mechanic tools, you might want to invest in a few of them. This helps when you need to grab a screwdriver and fasten a screw on your machine. However, this would result in many visits to a tool retail store whenever the need for a tool you don’t have arises. A tool kit helps to have all tools organized into one system or storage. People, for instance, that have had problems with their tools getting lost in the car or garage would appreciate such a kit. Also, it never gets easier than getting a screwdriver from a pool of them than having them stacked in a socket of theirs, clearly labeled. Also, you could imagine of a situation where your vehicle broke down along a busy highway or in a secluded road with nobody to help you. In either case, you would be lost for options if you cannot reach for a wrench or other important tools such as manual ratchets or cordless ratchets to help you get going. With a tool set though, it’s easier to get the right tool when you need its help. Stacking your tools haphazardly has many implications including rendering them damaged and useless. Also, they get exposed to things like rust and its agents. However, when you lock them away in a tool kit, it helps keep them safe from forced wear and tear. In addition, a tool set helps enhance the durability of tools contained in it. This is because they come in different sizes which means you can choose which one to use for what tools. Also, this helps keep each tool at a place where it’s freely accommodated and without constraints. There is nothing that can make your tools reliable than having them at the same place. It becomes easier, especially, if you can grab a tool when you need it and make use of it. This is in addition to the ease of traveling with your box from one place to the other conveniently. Also, most of the tool boxes are compact in size but with enough space in them. With them, thus, it becomes easy ferrying them even in the smallest space in your car. So, whether you’re traveling with a big truck, lorry, or a small car, you can push it somewhere in the trunk with no hassle. When it comes to buying a mechanic tool set, due diligence needs to be done. This will help you to avoid making blind purchases. It will also help you to avoid buying something that you will be returning as soon as you start using it or dispose it after some weeks of use. Before you can commit to buying anything, the price is always a major factor to consider. As a pocket-conscious person, you should not go ahead doing blind purchases since you never prepared on a budget to work on. This will see you overspend and buy things you hadn’t planned for. Whenever you’re buying a particular tool, your decision is guided on the intended use of the tool. The same case applies to the entire tool set since every tool has to have a purpose. A good example is for a home mechanic choosing general sets of tools for everyday household repairs. The mechanic in this case won’t need an extensive selection as compared to a large garage owner. You may have the most extensive selection of tools in your tool set but the case housing them is not up to the task. This might sound like a negligible detail but it’s an important thing when it comes to everyday functionality of the tool set. Since you want a box that organizes and holds all your tools in place, you should look for a high-class case that won’t break off, corrode, or break easily. The other important aspect to consider is the finishing and grip of the tools in your desired set. The finishing determines how long the tools will last while the grip says how they will feel when you’re using them. If you are determined to use your tools for long, they should have comfortable grips and long-lasting finishing. On the tools, you should also ensure to thoroughly check the contents of the kit. Most of the suppliers will focus on false abundance which means you might find more than one tools in duplicates. It is, therefore, crucial that you check every tool before settling for it. The weight of the tool set is another point of concern for most people. This is so especially for people who are constantly on the move from one workshop or client to another. If you’re this kind of a person, you should ensure the weight of the set is one that you make with comfortably. We feel that the best craftsman tool set is the Craftsman 230-Piece... The tool kit would be every mechanic’s dream kit with a total of 230 essential tools. 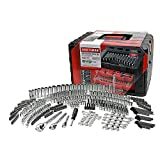 If the budget is the determinant, we have the Craftsman 108 Pc.... With 66 socket sets, nut driver bits, hex keys, and 39 specialty tools, the set is worthy compared to its inexpensive price. If your budget is not a challenge, we have our premium pick mechanic’s tool set. The Craftsman 450-Piece... would make it for you. With 191 sockets, extension bars, and a combination of wrenches and a total of 450 pieces, it’s no doubt worth the premium class.